Calling all mothers! What are you going to do this Sunday? 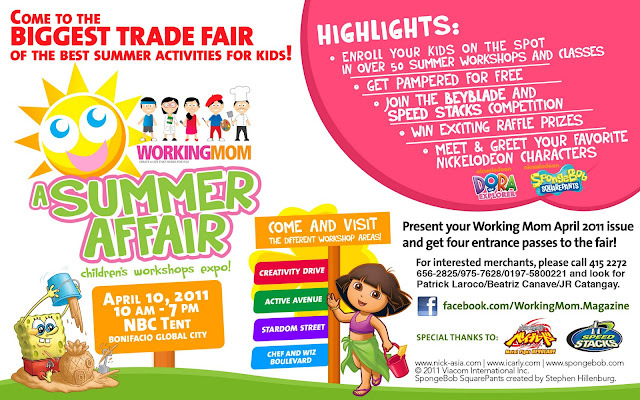 Working Mom magazine is having this great trade fair on April 10. You might want to go to NBC Tent to check out Working Mom's A Summer Affair: Children's Workshops Expo! - Get exclusive discounts and freebies from over 50 merchants offering the country's best summer enrichment programs as well as quality and exciting products for kids and moms. - Moms get pampered for free! - Join the Beyblade and Speed Stacks competitions and win exciting prizes. - Meet and greet your favorite Nickelodeon characters – Dora the Explorer and Spongebob Squarepants! - Freebies and raffle prizes are up for grabs!